Marigold over at Hideous! Dreadful! Stinky! is organizing a summer sewing challenge: make a skirt (or dress) a week for the month leading up to summer. To help those of you participating in this Summer of No Pants, I have a tutorial for an easy a-line skirt. My least favorite part of making a skirt is hemming. You’re nearly done with a skirt – you can try it on and see how beautiful it will look – but you can’t wear it out just yet. It still needs a hem. You can hem it by hand, folding up the edge half an inch and then three more inches and taking tiny stitches along this edge. Your skirt will hang nicely, with a clean edge ready for twirling. But this beautiful hem will take hours, postponing that exciting moment when you leave the house in your new skirt. You could take the easy way out, folding up half an inch, then half an inch again and stitching it down on the machine. But it’s hard to make the curved edge of a skirt lie flat like this, and even when you get it right it gives the fabric a stiff edge that doesn’t move as well as a wider hem. The solution? A contrast band sewn around the edge. It can be sewn on a machine, there’s nothing to keep flat, it doesn’t stiffen the bottom edge, and the contrasting color is a nice detail. Making a pattern for an a-line skirt is pretty straight forward. I made half a pattern piece and cut two pieces on the fold. Measure around your waist (where you want the skirt to sit). 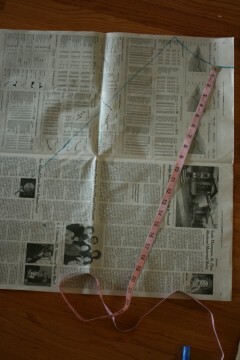 Draw a slightly curved line 1/4 this length at the top of a large piece of paper (newspapers work well). Next, measure from your waist down to the point where you want the skirt to end. Subtract 3” from this measurement to get the length of the skirt (you’ll add the extra length back in with the contrast band at the hem). Measure out the skirt length straight down from the inner edge of the waist curve and draw along this line. When you cut your fabric pieces, you will fold the fabric in half lengthwise and put this line along the fold. Measure the skirt length from the outer edge of the curve, angling the measuring tape out somewhat to give the a-line shape, and draw along this line. Measure out several other points along the waist curve and mark where the end of the skirt will be. Draw a curve connecting these points. 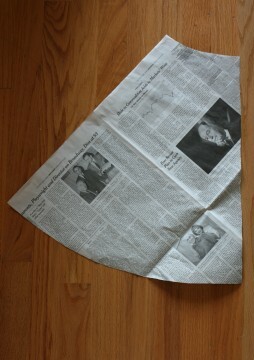 Cut out your pattern piece, fold your fabric lengthwise, and cut two identical pieces. This will be the front and back of your skirt (for this skirt the front and back are identical). Measure the bottom edge of your skirt and cut out a 6” wide strip of contrast fabric 1″ longer than your skirt edge. You may need to sew together two or more pieces of fabric to get a long enough strip. For the waist band, cut out a strip of fabric 3” wide and 1 1/2” longer than your waist measurement. To assemble the skirt, sew the front and back together along one side. Fold the waistband in half and sew it to the top of the skirt. Put in the zipper at the open side and sew up the rest of the that side. Fold the contrast band in half lengthwise with the right side of the fabric facing in. Sew up the end of the band, making a loop. Fold together the remaining edges of the band so that only the right side of the fabric shows. Sew the contrast band to the edge of the skirt. Putting in zippers is my worst sewing skill. I don’t have a zipper foot (I don’t know why not – I used to have two. They didn’t break and I don’t know how I lost something that never left the sewing machine table, but somehow I did), I pull too much on the fabric so the zipper buckles, and I’ve never figured out what to do at the end of the zipper where the seam starts. But this skirt needs a zipper, so here’s my best explanation of how to put one in. First, sew down the bit of the zipper that extends past the teeth. Next, place your zipper at the edge of the fabric with the front of the zipper facing the front of the fabric. Sew the fabric and zipper together along the very edge. Do not pull on the fabric while you do this, or your zipper won’t lie flat. Repeat on other side. The bit of the zipper you pull on will get in your way at some point. When this happens turn the needle all the way down into the fabric, lift up the presser foot, and pull the zipper out of the way. On the outside of the skirt, turn over a small flap of fabric to cover the zipper. Sew down this flap from the top of the zipper to the bottom. Put the needle into the fabric, lift the presser foot, and turn the corner. Fold over a flap along the other side of the zipper and sew down the bottom of both flaps. Turn the corner again and sew up the other side of the zipper. Your zipper is in! Time to sew up the seam. I don’t know what other people do (maybe sew up the seam before they put in the zipper), but I have trouble sewing right next to the zipper, so I do the first couple of inches by hand, then switch to the machine. 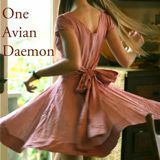 The Summer of No Pants crept up on me unexpectedly – one weekend I thought I had all the time in the world, the next I realized that between my sister’s graduation, my best friend’s dance show, and a big wholesale order coming in, all that time was filled. So I rushed to make this skirt right away from supplies I had lying around the house. On the whole this worked out well, but I didn’t have a long enough zipper in a remotely appropriate color. So I was stuck with a 5″ pants zipper. To fill up the extra space I needed to get into the skirt I added a button. If you’ve never made buttonholes before and are trying to turn out a skirt a week, I don’t recommend it, but if you just love the way it looks on my skirt and want a button of your own, here’s what you do. Cut your waistband with an extra inch of length. Before you iron it down, fold it in half with the right sides facing in, sew up each side, and sew an inch along the bottom of one side. Turn it right side out, iron, and sew in as normal. Put in the zipper so it comes up to the bottom of the waistband. Cut a slit large enough to put your button through in the extra flap of waistband. Sew around this slit with blanket or buttonhole stitch (see picture). Sew the button to the other side. What a fabulous skirt, I love the color, nicely done! what kind of fabric did she use ? Lovely! I like the pattern on your skirt! Looks great for every occasion! LOVE the fabric and the finished skirt! And totally agree with you about the hemming. It’s boring, especially when you’re soooo close to being finished. To make the loop you sew the short ends of the strip of contrast fabric together. This makes your long strip of fabric into a circle, which is the right shape to sew to the bottom of the skirt. Then you fold it in half so both of the raw edges are on one side and the other side is the fold, and sew those raw edges to the bottom of the skirt. Does that make more sense? Ahhh, yes. I didn’t realize you sewed the contrast band onto the skirt in that way. Does it make it easier to attach to the skirt that way? Well, folding it in half means the bottom edge is already finished, which is what I really wanted from the contrast band, and sewing the ends together first means that seam only has the right side showing, even inside the skirt. It’s not necessarily easier than attaching it another way, but it makes for a nice finished look. Question about adding the button. I have a skirt that will fit at the waist but won’t stretch over the hips. Could I cut the waist band and add a button as described above? I don’t think that would help. Since it doesn’t fit at the hips, you need to add to the skirt there, not at the waist. If it’s an a-line skirt (or another style that’s larger at the hem than it is over the hips) you could fix it by shortening it. Pick out the seam attaching the waist band to the skirt, cut a few inches off the top of the skirt, where the waistband was attached (try it on at this stage to figure out how much to cut), and sew the waistband to the top of the skirt where you just cut, easing in the skirt. I loved this so much that I decided to make one myself! I have never made anything other than a quilt really, but my skirt actually turned out! I was wondering, is this able to go in the washing machine, or do I have to wash it by hand? I’m so glad it worked out! How you wash it depends on what it’s made of. Cotton fabric shrinks the first time you wash it, so unless you washed the fabric before you started sewing, you should wash it cold and line dry it. Synthetic materials generally don’t change as much in the wash, so you could probably put it in the machine. Silks and wools should be dry cleaned, but I doubt that’s what you used. In general when you’re sewing clothing you should launder the fabric the way you’re going to want to launder the finished garment. That way any shrinking or bleeding dye happens before you start. Wash the fabric on it’s own, because some fabric loses a lot of dye in the first wash (think new dark jeans). color catchers work great for visual on how much dye your fabric loses. i was skeptical but won’t sew without them now.. also, save the softner for the finished product.. for this skirt, a medium weight cotton or polyester blend or gaberdine (medium weight polyester) is great, but be sure that the fabric you choose is wrinkle resistant….. btw i love the pattern.. saves about $10-12 and is really easy. i usually use elastic waist but a ziper is ok too. Another tip.. consider that the seams are on the sides… if you fold the fabric so that you have center front, center back…in order for the skirt to hang properly the center front should curve slightly to be 3/4 inch lower than the side seam and the center back should be 1/2 inch lower than the side seam. . and don’t forget .. the zipper is always on the left side of a skirt unless it is in back. Thanks again for the great pattern! Wow, what a great skirt! I love the button closure and that it was a result of improvising. I, too, HATE hemming my projects—-I always dread it. I like your skirt. am is missing something or did you leave out how to do the hem band of the skirt? This website was using a band on skirt instead of sewing hem. It’s in the “putting together the skirt” section: Fold the contrast band in half lengthwise with the right side of the fabric facing in. Sew up the end of the band, making a loop. Fold together the remaining edges of the band so that only the right side of the fabric shows. Sew the contrast band to the edge of the skirt. Love it! I’m going to give this project a try! Thanks for writing about it. Thanks for the tutorial. Is there any chance you could tell me where I could buy the fabric you used for your skirt! I adore green and that’s exactly the right shade. My fabric comes from a local fabric store, Stone Mountain and Daughter . I’m sure other places have it, but I don’t know exactly where. Sorry I can’t be more helpful! This is an amazing skirt, so chic, so simple. Thank you for sharing and feeding my skirt habit…must. make. new. skirt. today. Cheers! I lost my sewing machine manual ages ago but I have a foot for a button hole (I believe) but no clue how to use it, embroidery thread to keep the edges from fraying is a glorious (and pretty quick) solution. I think I have an ambitious trip to the fabric store this evening. My biggest challenge is finding beautiful fabric like your examples to work with. When I get home it always seems my fabric of choice at the store was either all wrong for the pattern/design or all wrong for my taste; though it never seems that way when I’m surrounded by all the beautiful fabric in the store! This tute is awesome, thank you so much. I’m not really the most experienced sewer and I’ve managed to put one together in a couple of hours. I found that I had to put a couple of darts in the waistband though, to stop it gaping at the top. Can’t wait to show my new skirt to all my friends! so wait. why did you make the tube and flip it inside out? wouldn’t it be much simpler to fold and press the contrast fabric, then sew both layers to the bottom of the skirt? Or alternatively you could sew one edge of the contrast fabric to the skirt and then fold the other side up and top stitch that up. I didn’t make a tube, just folded it and sewed it on. But yes, any of those would work. I hadn’t seen that technique before! It looks like a great way to finish edges. I made this skirt this morning and I am not normally good at sewing clothes. This tutorial was SOOO easy to follow! Thanks! Thanks for the tutorial.Iwas having problem with sewing in of zippers without the zipper foot.Now i can happily finish my project.thanks!! What a great tutorial – thanks for sharing and taking the time to put this together! I can’t wait to try this!!!! My mother taught me this trick also and it works very well! I just read your idea for putting in a zipper and it is BRILLIANT! Zippers have been the worst of my sewing skills, for some reason. I am going to try your method, Kara. I already do the basting of the seam but the securing of the zipper was always a problem. Thanks for a great idea! Such a nice skirt! What is the name of the fabric you used? I have tried to do my own patterns-totally hopeless. I have lots and lots of vintage tablecloths. Sooo I picked one out that didn’t have wine stains or red sauce stains and used one of them. Fantastic! Already had a hem! Very small but a HEM. What a great skirt. Cotton, funky fabric and the right width for a skirt. Flirty. Double over and cut to the length you want. I added an elastic band to the top. Voila-A SKIRT! I have made 3 so far and will make many more. I bet using a double needle would make a very nice hem…although it would still be machine done. Do you add seam allowance when you cut everything out? It doesn’t seem like it is being added when you measure and make the pattern… I could just be missing it, though. Yes! Add seam allowance! I forgot to put it in the pattern instructions, but you definitely want to do that. Thanks for pointing that out. I love this skirt!!! However, I wonder if I’m misunderstanding the directions about the hem. I’m trying to imagine how it works if you close the hem loop before sewing it on. Does that mean it has to be exactly perfect in terms of length? In other words, it seems like if you sew both circles together (the skirt and the hem), it would be so easy for one to be a teensy bit shorter than the other and then you’ll have puckering because you’ll have to adjust for that at the very end of the circle. That’s true, you need to measure pretty carefully. If you end up needing to ease it in slightly, you can iron it so the easing doesn’t pucker. If you’re really worried about it, you can certainly sew the band to the bottom of the skirt and then sew up the edge. I prefer the other way, because you can sort of see the seam if it ends right at the bottom of the skirt, but that’s not a big deal. For a ruffle lover – cut the band 2-3x longer. Sew the loop. Press in half. Pin skirt at eights. Pin loop at eights. Lin up pins. Ruffle the band to fit the skirt. For way more fun, ruffle some tulle over the top and sew down with an adorable dinosaur ribbon as the ruffle loving daughter asks for to match the dinosaur shirt her brother outgrew that had a tulle skirt added to the dinosaur to cover a small repair. As the twirly skirt wearer here is rapidly growing, I made the top from an old camisole tank folded over, dinosaur ribbon at the seam, and a ribbon drawstring so it can grow with her. Hi, thanks so much for this tutorial and making it so SIMPLE. I even appreciate your take on hemming and zippers – whenever I go to a sewing class, patience and perfection are expected – but they do NOT come naturally to me. Thank you for this well explained tutorial! Nicely done. Just have to find some nice fabric and I can start on this project! I can’t wait! Thank so much for sharing this tutorial. I was wonder if I have to cut on a bias the band for the hem? Cheers!! No, I just cut it straight. I tried to create this pattern but I ended up making it too small. I am a beginning seamstress, so was I supposed to cut it along the fold? The instructions just said fold the fabric length wise? I’m sorry your skirt didn’t come out! Yes, you have to cut each piece along the fold. I love this and am excited to make it, I picked up some blue and white polka dot fabric for it. I am a little confused about the waist band. Your tutorial says sew in as usual. My problem is that I don’t know how to do that. Any advice would be appreciated! Also on a different note, do you know how to add a waistband like the one you have here on a seamless and zipper less circle skirt? Sew the rough edge of the waistband to the top of the skirt with the right sides facing each other. You can pull on the skirt ever so slightly if it’s a circle skirt or a very full a-line to get a more flattering fit. If your skirt is completely seamless and zipperless, it has to be stretchy and so does the waistband, or you won’t be able to get into it. If you’re working with something stretchy, you can cut a strip as long as your waist and twice as wide as you want to waistband to be, sew the short ends together, fold down the top of the circle so that the two rough edges are together, and sew that double edge to the skirt with the right sides facing in. 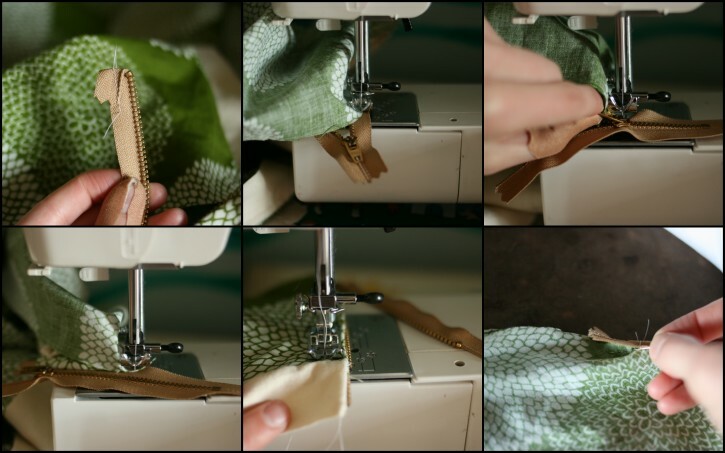 If it’s not stretchy, put in a zipper (or buttons or even velcro) like in this tutorial. Or make it large enough to fit over your hips and add elastic or a drawstring to pull in the waist. Actually, you should hang the dress for 3 – 5 days to let the bias stretch out before hemming. Check the hem and re-cut if necessary. THEN hem. Otherwise, you’ll have to re-hem because the hem will be longer in spots and look uneven. That’s the problem with most of the ready-made dresses and skirts today. Just a quick waist band question–Do I attach it in a way similar to the contrast band at the bottom (rough edges together, right sides facing each other, sew and then press the seam open)? Also, do I place the zipper so that it goes to the top of the contrast waist band? Thanks for your reply–I love the pattern! Yes, that’s the right way to attach the waistband. And if you’re just using a zipper (no button), then yes, put the zipper in so it goes all the way to the top of the waistband. Thank you for this tutorial. 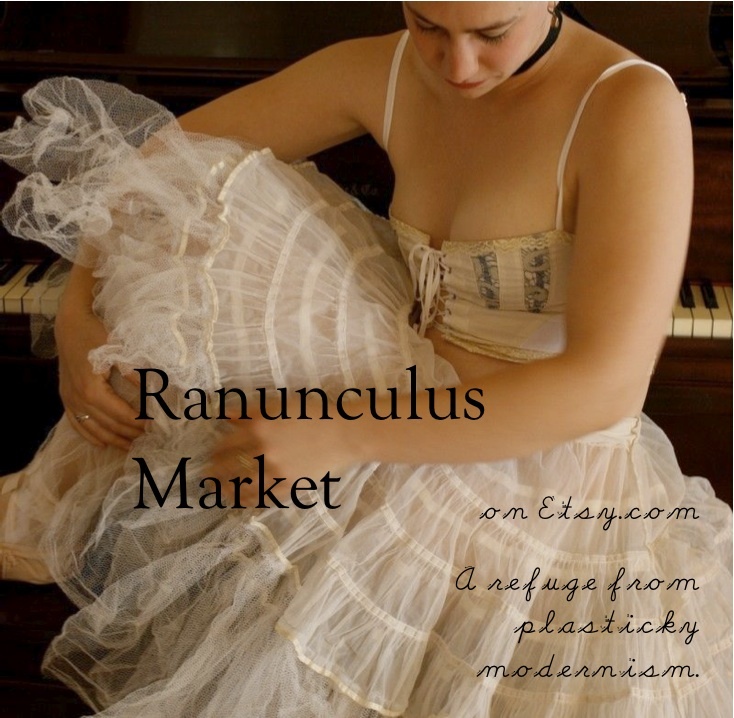 I used it to make myself a skirt for summer – and all mistakes were mine alone! I have now linked to this on my blog so others can use it too! I love the way this skirt seems to hold the A-line shape! Can you please tell me what type of fabric you used? Quilting cotton. The seam around the bottom that attaches the band helps hold the shape too. I can give you the easiest way to put in a zipper, if you like! Does it matter how wide you make the a-line? I’d like to make a full length a-line dress. How wide you make the a-line depends on how full you want the skirt to be. For a full length skirt you’ll want it to be quite wide at the hem – imagine you were making a shorter skirt and then extend it in a straight line, keeping the angle the same. This tutorial is brilliant, I dabble in stitching and am always looking for new ways to make gifts. With my wife’s birthday and Christmas so cost together I often get caught out with making one present and running out of time with the other. Thanks for the tutorial and the inspiration! Thank you for this – my daughter needed a skirt for ‘International Day’ at school and I found a photo of your skirt on Pinterest and knocked this up in just over two hours! I’m a beginner sewer and it was really easy (though I did add extra to the pattern for the seam allowance). Thank you very much! There’s a photo of the finished article on my twitter feed (link in the website box). Stranger with a question here. Do you know if Im making the dress shorter, will I need less of the base fabric? Love this pattern – I hadn’t sewn in about 10 years (altering costumes for the Dance Company I am affiliated with aside) when a friend asked me to make her a skirt….I of course said yes – ha, ha! Then she asked for a pocket…I just wanted you to know that in lieu of a zipper I made a pocket (open at the top)- using the space where the zipper would have gone and it worked out great! Two buttons on the waist band keep the skirt closed. This is exactly what I’ve been looking for! I’m going to whip this up tomorrow. So excited about the contrast band at the bottom as a hem and a way to give this skirt a cute drape because of the weight at the bottom. Love your fabric selection too. Mine is a bit of a novelty print (bicycles) but they are not too juvenile to work out well in a woman’s skirt. Can’t wait to make it now! She’s living the skirt, 1 year on, here’s to the trying another three. I recently found out that the Shop with the fancy, lovely green fabric with white dots ,I would die to get, is in Berkeley. I was on hollyday in san Francisco this summer without knowing about this store. I live in Norway, Europe and will probably not go back to San Francisco for ages. Oh, life is unfair.